Do not try to remember. Bruce Goff, a self-trained architect and long-time mentee of Frank Lloyd Wright, instilled this idea in his students at the University of Oklahoma (OU) during his tenure as chairman there from 1947 to 1955. Instead of copying the popular Beaux Arts and Bauhaus styles of the recent past, Goff wanted architects in training to express their own creativity and views of the world through designs that avoided architectural stereotypes and instead presented a radical future. This era of educational exploration and disruption became known as the American School of architecture. Historian and OU Visiting Associate Professor Dr. Luca Guido is the curator behind the exhibition, Renegades: Bruce Goff and the American School of Architecture at Bizzell. Now on view in OU’s Bizzell Memorial Library, it details the widespread influence of Goff’s personal teaching style and the program he built, which attracted students to the American Midwest from as far as Japan and South America. The exhibit features large-scale drawings by alumni, as well as uncovered models and writings from Goff’s students and colleagues like Herb Greene, Elizabeth Bauer Mock, Bart Prince, Mendel Glickman, and Jim Gardner, and Bob Bowlby, among others. Built from the school’s expansive American School archives, the show unveils former students' work that’s been so pristinely preserved and restored, it all looks like it was completed yesterday. Goff, who seemed to have encouraged serious attention to presentation, penmanship, and shading, left behind what Guido considers a “gold mine” of materials. Every framed assignment on view is a piece of art in and of itself—a testament to the architectural educator’s guidance. “Bruce Goff introduced a new architectural pedagogy,” Guido said, “and the School of Architecture at OU endeavored to develop the creative skills of the students as individuals rather than followers of any particular trend. The drawings represent the evidence of an extraordinary and, at the same time, little known page of the history of American contemporary architecture.” That history is one that OU is now trying more heavily to build upon. As one of just two architecture schools in Oklahoma, OU lures students from across the state, nearby Texas, and around the globe to the small town of Norman. It was considered a world-class institution during Goff’s years and still seeks to live up to that legacy today. Since becoming head of the school three years ago, Dean Hans E. Butzer has worked to re-elevate its status. “Our discussions over the past few years prove a symmetry between those defining aspects of the American School and the overarching strategic priorities of the Christopher C. Gibbs College of Architecture,” he said. “The work of the American School of the 1940s, ‘50s, and ‘60s may be described as contextual, resourceful, and experimental. Today, we have set the goal of graduating entrepreneurial students who design resilient cities, towns, and landscapes through the lens of social equity and environmental sustainability.” This idea is evident in the success of last year’s graduating class. As of fall 2018, one hundred percent of architecture students secured a full-time position within six months of graduation, according to Butzer. Only two, the faculty jokes, didn’t get hired. They instead went on to begin master’s degrees at the Harvard Graduate School of Design. When asked why OU graduates are so attractive to firms across the country, Butzer noted the work ethic and creative problem-solving skills they learned as students. Teaching students to speak up, stand out, and work hard can be traced back to Goff’s presence at the school and his own career as an eccentric architect who always put the client first and aimed to “go the extra mile,” according to Guido. His modus operandi was to first connect deeply with the client, ensuring the end result was strictly their vision. His objective was to never design a building he personally wanted to live in. Some of Goff’s most famous structures, the Ledbetter House in Norman, the ill-fated Bavinger House that was demolished in 2016, as well as the Bachman House in Chicago, took on forms reminiscent of Wright’s residential work—low-lying residential homes with surprisingly large interiors, cantilevered carports, and large windows—but they all displayed a curious amount of flamboyancy that was signature to Goff himself. The architecture of his early years, such as the historic Tulsa Club and the Art Deco-designed Boston Avenue Methodist Church, are celebrated landmarks in Tulsa and reveal Goff’s visual personality. Goff was also a champion of sustainable and site-specific construction; he often utilized local materials for his projects. Fittingly, Goff rejected the idea of having a personal style of architecture. Some of Goff’s mid-century work and the sketches of his students from this time seem to be inspired by Atomic Age tropes. Viewing them now, they’re so futuristic they probably seemed structurally unbuildable at the time, but the geometries that came out of the American School were forward-thinking and technically-advanced. During Goff’s leadership, architectural courses fell within OU’s College of Engineering where students were taught how to complete construction drawings and to specify materials. But in Goff’s classes, it was all about creativity. “Bruce Goff didn’t believe in critiques,” said Guido. “He wanted them completely free to propose what they wanted. 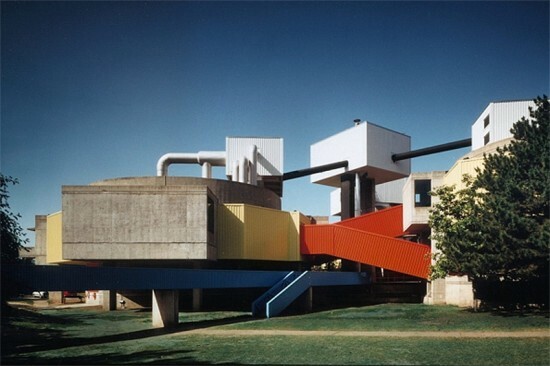 The assignments were structured around abstract themes that allowed the students to express themselves in the best possible way because for Goff, there would be no little Corbusier's, no little Mies's, and even no little Goff's. He didn’t want his students to become followers of someone. He wanted them to abandon all memory of what came before them.” Renegades: Bruce Goff and the American School of Architecture at Bizzell is on view through July 29 and will turn into a comprehensive traveling exhibition this year with a stop at Texas A&M University in the fall. The OU Libraries also has plans to secure the preservation of the archives by making them part of the school's Western History Collection and digitizing select images for online research. The Egg Church. The Church of Tomorrow. An “honest architecture” that’s forever contemporary. Since its opening around Christmas in 1956, these are a few phrases that have been used to describe First Christian Church, a historic, organic modernist building in Oklahoma City. Designed by the then-young local firm, Conner & Pojezny, the 32-acre project quickly became a state treasure and was lauded as a major engineering feat by Life Magazine, Newsweek, and Architectural Record. 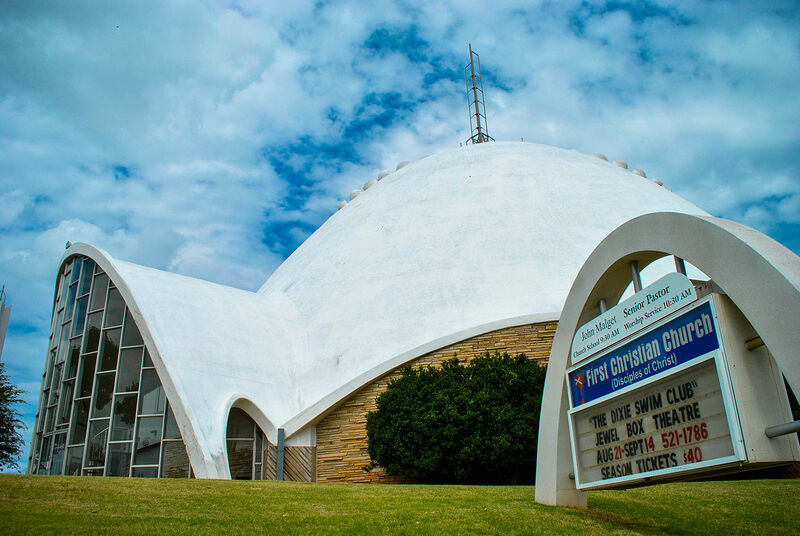 The dramatic, concrete domed church—which has a mid-century Jetsons look—is newly in danger as its current owners aim to sell it to a buyer with plans to demolish the community icon. Oklahoma’s News 4 reported that dozens of demonstrators crowded outside First Christian Church last week in protest. Those in attendance included the executive director of Preservation Oklahoma and members of Okie Mod Squad, a group led by one of the church's architect's granddaughters, Lynne Rostochil. Representatives told News 4 they’re worried the building might be knocked down once it's successfully sold; the property went on the market in 2016 and only recently snagged attention from buyers when the asking price was drastically lowered from $8.2 million to $5.65 million. The broker behind the sale hopes it'll become a mixed-use development. Many mid-century structures around Oklahoma City have come under threat in recent years. One of those was Founders National Bank, a Bob Bowlby–designed structure that boasted two, 50-foot exterior arches, It was leveled last October. Like R. Duane Conner and Fred Pojezny, who designed First Christian Church, Bowlby came out of an era in which architectural education in Oklahoma was transforming the industry. 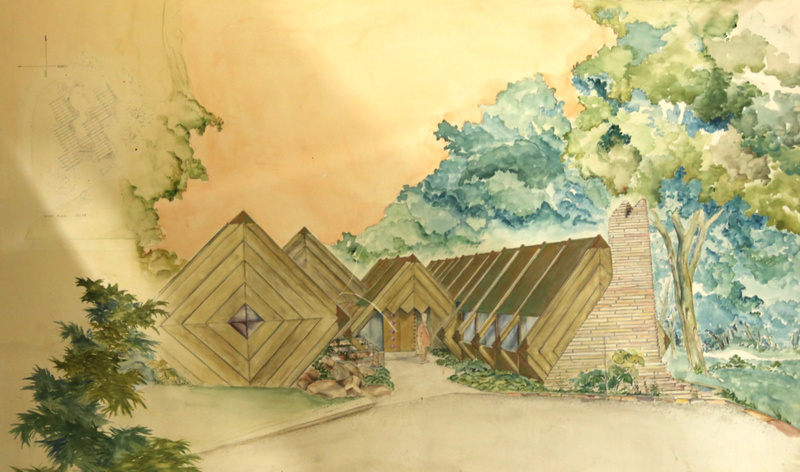 Bowlby studied at the University of Oklahoma under the direction of famous American architect Bruce Goff who was internationally known for his expressive, organic designs and for creating an innovative program with the school’s architecture department. 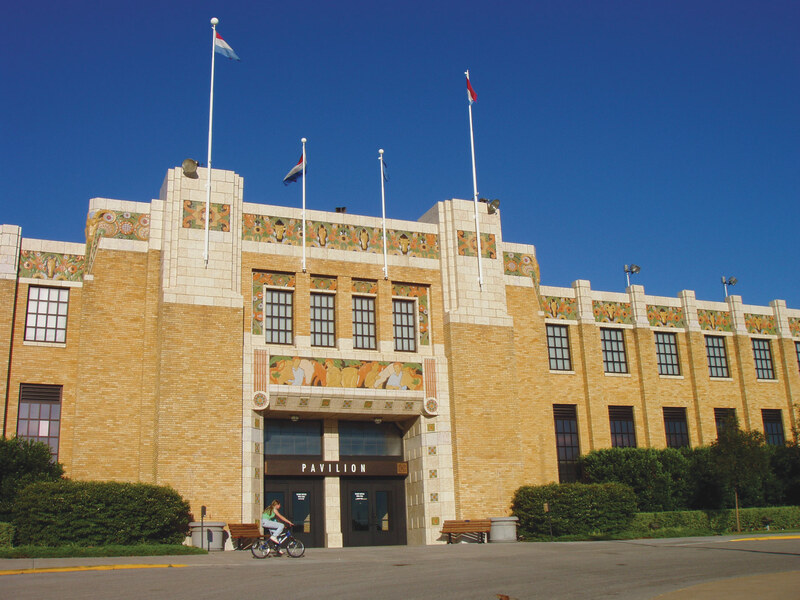 Because of Goff's widespread influence, as well as the work coming out of Oklahoma A&M where Conner and Pojezny graduated, the city benefited from a slew of forward-thinking pieces of architecture, many of which have just surpassed or are nearing historic-designation age, meaning they’re potentially endangered if not in use. In order to protect First Christian Church, a Change.org petition started by Okie Mod Squad has been circulating that urges city council members to officially landmark the building, a designation that would require future development on the site to go through a public approvals process. Rostochil noted in a February post that thought the building was put on the National Register of Historic Places in 2011, this “in no way protects it from being demolished.” The move only now qualifies it for tax credits to repurpose or restore the structure. The efforts of the “Save the Egg” protestors have resulted in a city council meeting happening on Tuesday, according to News 4, where local lawmakers will discuss whether or not the church can potentially be declared a landmark. If identified as such by the Historic Preservation Commission, then the new buyer would not be able to make significant changes to its original design without prior approval from the city's Historic Preservation Commission. The protections would include the entirety of the Edgemere Park property, not just the iconic, egg-shaped main sanctuary. Conner and Pojezny designed three additional structures on the church’s campus, including a four-story education building and a small fine arts complex known as the Jewel Box Theatre, the city’s oldest, continuously-operating community playhouse. It took the architects three separate tries over several years to come up with the current design for the $2.1 million development, which the church’s renowned minister, Bill Alexander, wanted to be a “Church for Tomorrow.” In an old newspaper clipping cited on Okcmod.com, the design team said they aimed to take a “decided departure from conventional church construction” by building an “honest architecture” that would make it forever contemporary. For residents in Oklahoma City, not only does First Christian Church reflect the history and character of the region’s modern architectural landscape, but it also serves as a place of spiritual solace and refuge in tough times. In October of 1995, families gathered there after a terrorist struck a downtown federal building, killing 168 people and injuring over 600 others. The bombing remains one of the deadliest terrorist attacks in U.S. history and to many locals, First Christian Church stands as a memorial to community healing. 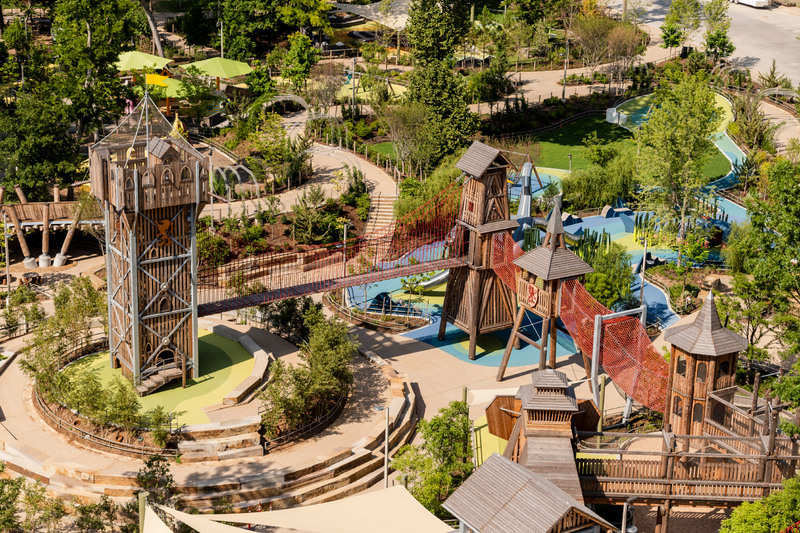 The Gathering Place, Tulsa, Oklahoma’s newest public park, is anything but basic. Opened in early September, the 66.5-acre riverside landscape looks more like an ultra-green theme park than a typical urban park with trees thrown in for shade. Designed by landscape architects Michael Van Valkenburgh Associates (MVVA), the $465 million project was dreamed up by the George Kaiser Family Foundation and backed by over 80 other local corporate and philanthropic donors. It’s located just 2 miles from downtown Tulsa on a formerly flat, scorching site along the Arkansas River. After four years of the first phase of construction, it’s now one of the city’s greatest amenities, providing spots for sport, relaxation, and water play underneath a sprawling tree canopy and atop grassy open lawns. MVVA transformed the topography of the existing site by creating various elevated landscapes and other sunken spaces with access to water. The firm also accentuated the native ecologies of the parkland and introduced wetlands, meadows, streams, and dry areas that inspire different types of interaction with nature. Thick logs for seating, fingerlike tree trunks for gathering, and local stone used for walls and mazes were additionally incorporated to connect the landscape as a whole and link it to the surrounding region. While the park boasts threads of regional bike trails, courts for ball-handling sports, and 21 points of entry and exit, it’s the surprising structural elements of play that make it stand out. MVVA designed a 5-acre adventure playground for kids age two to 12 that features seven thematic spaces: Volcanoville, The Land of the River Giants, Royal Tower, Fairy Land Forest, The Ramble, Spiral Connector, and Mist Mountain. According to the architects, these play areas are “boldly expressive and richly programmed,” with normal playground elements such as towers, suspension bridges, and slides, but also fantastic designs like climbable, large-scale animals, flowers, and fruit. Many of the play accessories are clad in steel as well as timber imported from the Alps. Accessibility is a key component of The Gathering Place. MVVA describes the guiding vision of the park to be a democratic space where all Tulsans can come together and experience an array of physically challenging and leisurely activities. Children in wheelchairs can easily access the playscapes through elongated ramps on all of the structures, like the giant, wood-slatted elephant with a truncated slide. The park also includes a pond and boathouse where families can check out kayaks, canoes, and paddle boats. A coffee and ice cream cafe, as well as a dining patio and other picnic areas are situated in the northern part of the parkland near the play spaces to encourage extended stay. Toward the park’s south side, MVVA designed the Sky Garden and Four Season Garden, as well as Swing Hill, situated on the highest point of The Gathering Place with prime views of downtown Tulsa. At the farthest end of the park, visitors can enjoy courts for basketball, volleyball, street hockey, and soccer, or ride over to the skateboard and bike park, which offers courses for all ages and levels. A 50,000-square-foot children’s science museum will also be constructed in this area, coming late summer 2020. Phases 2 and 3 of construction, beginning next spring, will bring the park to a total of 100 acres. 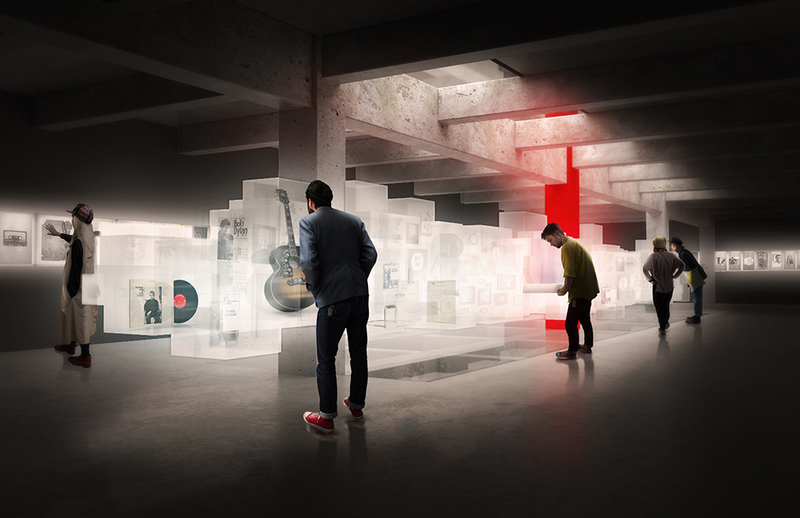 The George Kaiser Family Foundation has just announced Seattle-based design practice Olson Kundig as the lead architect and exhibit designer for The Bob Dylan Center, a new exhibition space dedicated to the works of renowned singer-songwriter Bob Dylan. It will be located on Martin Luther King Boulevard southeast of the Woody Guthrie Center in Tulsa, Oklahoma. The center will be the public venue for The Bob Dylan Archive, and is expected to break ground in 2019 and open in 2021. According to the center’s website, it will be home to a collection of more than 100,000 objects such as “handwritten manuscripts, notebooks and correspondence; films, videos, photographs and artwork; memorabilia and ephemera; personal documents and effects; unreleased studio and concert recordings; musical instruments and many other elements.” Olson Kundig won first place in the international competition for the job. In a rendering of the entrance released by the Foundation, an exuberantly colored painting by Dylan named The Beaten Path is printed on the wall. Curtain walls on the side introduce ample daylight to the seating area. 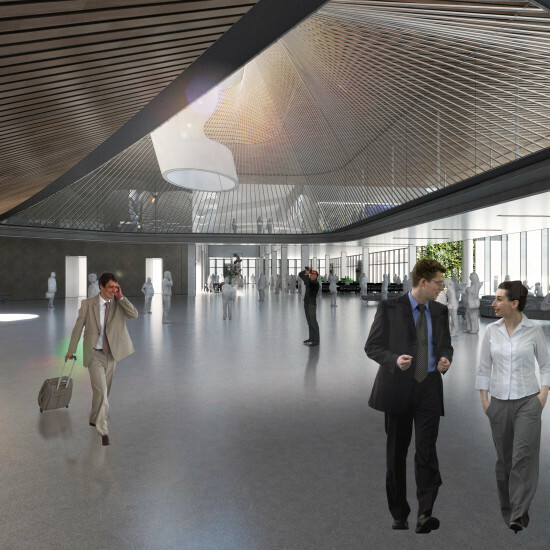 In a rendering of the semi-outdoor exhibition space, one of Dylan’s quotes from Chronicles, Volume One is printed on the ceiling. People can slide into wall indentations and read, text, or quietly indulge in Dylan’s music. In an interior rendering, light boxes containing Dylan’s personal items float above the ground. Olson Kundig is partnering with Tulsa-based Lilly Architects, the architect of record for the project. Plains of Yonder will be the partner for audio and multimedia experiences for the building. When I was in architecture school, I, like most of my contemporaries, doodled my way through lectures. In fact, I still do the same in meetings today. And as my pen inflicts the pages of whatever unfortunate sketchbook I have selected, I find myself more often than not being drawn to vandalizing the ring-binder hole punches in the margin. Never once did a doodle around this area of any page of mine result in the design of a building. Perhaps that is why I am not an architect. A look at Rand Elliott’s Full Moon residential complex in Oklahoma suggests I missed a trick. Elliott and his firm, Elliott + Associates Architects (EAA) have found a quite unique way to appease fire regulations and maximize a restrictive site to accommodate ten housing units. The 37-by-140-foot site at 322 North West 12th Street in Oklahoma City was, as Elliott described, “leftover” and “ignored” space. The architect chose the site for this particular reason. “I think Oklahoma is lacking living spaces that have a wonderful personality to them,” he said, adding that discarded sites are often in great locations and have potential. “I set about to try to design something that would be distinctive, a landmark, and a real attraction to a certain group of people who want to live around creative and artistic people,” he explained. In his assessment of the area, Elliott found that the percentage of window space available was limited. 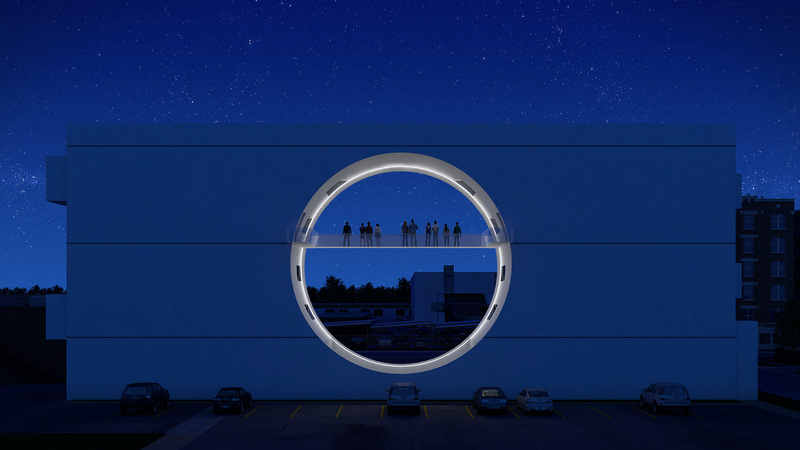 Having a series of small windows, he said, “seemed like a waste of time,” so instead he opted for an idea using an oculus 42 feet in diameter, embedded into a 60-foot-high sprayed-white concrete structure. The oculus is oriented so that it frames views eastward, onto a 1920s modernist brick neighbor, and westward, where residents can look out at the dramatic sunrises and sunsets typical in Oklahoma. It also shelters a small garden area below. EEA worked extensively with the city’s fire marshal’s office on the project. The unorthodox design required special attention due to the fire marshal having never encountered a proposal like this. Some design elements, such as the bridge spanning the upper level to provide more than one exit point, were born out of these discussions. As for the housing units, Elliott explained, each one interacts with the oculus and, instead of each one being a “cookie cutter,” every unit has a unique floor plan. According to the architect, every unit offers an 180-degree view, each with a different perspective. In October 2014, photos surfaced of John Johansen’s Mummers Theater, or rather, the theater reduced to a pile of scrap metal and rubble—the humbled remains of bold architecture traded in for corporate towers courtesy Robert A.M. Stern. In 2010, before its demolition, the 1970 theater was vacant and severely damaged by flooding. Finding funding for historic preservation, especially for structurally compromised buildings, can be challenging. And, if two Oklahoma state senators, Mike Mazzei and Rob Standridge, had their way—luckily the bill died on the Senate floor—more buildings could have lost funding sources for preservation and go the way of Mummers Theater. This past February, the two Republican lawmakers introduced Senate bill 977, a sweeping proposal to close the state’s budget deficit by nixing a slew of tax credits for two years, including those intended for historic preservation. Oklahoma’s Own News on 6 reported that the bill could affect Tulsa buildings like 400 South Boston, a planned hotel conversion; the TransOK building at Sixth and Main, a 30-unit residential building; and the Palace Theater, a residential conversion in process. The largest project to be affected is in the heart of downtown Oklahoma City: The $30 million renovation of the city-owned First National Center, a 33-story, almost one-million-square-foot 1931 art deco building at Broadway and Park Avenue. On January 7, 2016, Oklahoma City awarded Lewisville, Texas–based NE Development the contract to preserve First National and convert it to the mixed-use trifecta of residential, retail, and hotel. Senate bill 977 was introduced the following day, complicating the project’s timeline and casting momentary doubt on its financial feasibility. NE Development will not close on the building until after May 27, 2016, the day the legislative session concludes for the year. Right now, the bill is in legislative purgatory. It’s been stripped of its title, and a title-less bill cannot be made into law. Roxanne Blystone, Senator Mazzei’s executive assistant, said that the bill was amended to reinstate historic preservation tax credits. The sponsors of the bill could resuscitate the bill during the next session, although this is not likely to happen. While the near-certain death of the bill is good news for the historic preservation tax program, its mere presence has delayed the timeline of large projects like First National and all but killed smaller projects, especially in rural Oklahoma, observed Harry. Anticipating a delay like this, NE Development had two extensions related to preservation credits in its contract, “Mostly because it’s a longer process. We’re comfortable with our ability to get the credits, we’re just uncomfortable with whether they’re going to be there,” Harry noted, ruefully. Melvena Heisch, deputy state historic preservation officer at the Oklahoma Historical Society, said that she doesn’t know if the bill has affected any projects yet, but the agency was “quite concerned” about that possibility early on. 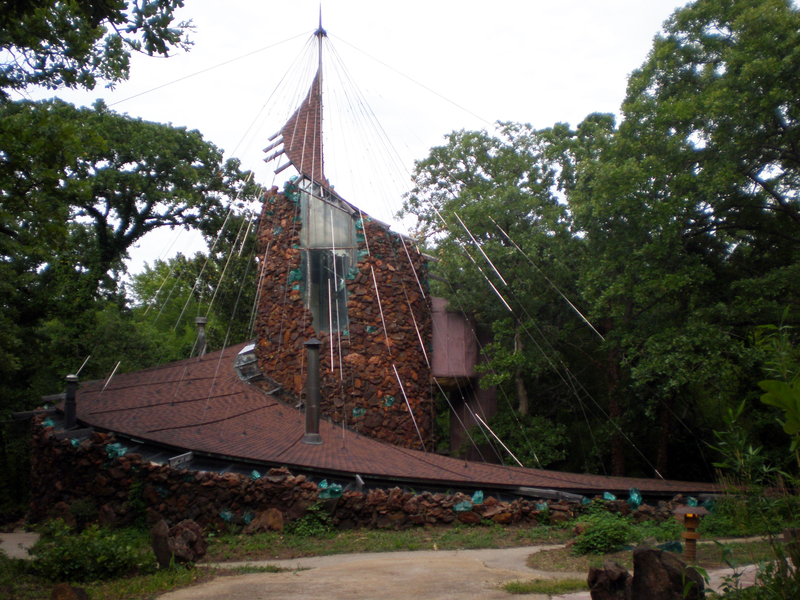 In 1987, the Bavinger House, designed by Kansas architect Bruce Goff was awarded the Twenty Five Year Award by the American Institute of Architects (AIA). Nearly 30 years on from receiving the award, Bavinger House, once lauded as a quintessential icon of organic modernist architecture, has been demolished. Originally built in 1955 in Norman, Oklahoma, Goff collaborated with artists Eugene and Nancy Bavinger as well as students from the University of Oklahoma to create a spiraling fan-like building whose core is shielded behind clumps of sandstone. The house's signature 96-foot-long spiral, which curved downwards in logarithmic fashion, mimicked that of a sail unfurling in the wind. Trapped in suspense, Goff showcased the tensile trends that were emerging in architecture at the time, with Frei Otto, a notable ambassador of this technique, earning his doctorate in tensioned constructions only a year prior. Among it's woodland surroundings, Bavinger House was pinned to the ground through a recycled oil field drill stem which was also used to elevate the central mast above 55 feet. With no interior walls, an array of multi-height platforms created space within the house while the ground floor was covered with pools and planting. For the House, Goff told the Chicago Tribune in 1995 that he "wanted to do something that had no beginning and no ending." "This house begins again and again," he continued. "Gertrude Stein talks about the sense of not being in the past, present or future tense, but in the 'continuous present.' I was thinking in those terms." In the decade leading up to 2008, however, reports filtered through of vacancy and the house's deterioration. Writing for the Architectural Review, Michael Webb said in 2005 that the house had "become as choked with vegetation as a lost temple in the jungle. It received the 25-Year Award from the American Institute of Architects in 1987, but today only the 'no trespassing' signs denote its presence—as a creeper-clad spiral of stone that can barely be glimpsed through the trees." After funding to restore the building ran into problems, the Bavinger House suffered more woes with heavy damage being inflicted after a storm in 2011. With the central spire being one of the more notable features in need of repair, the house's official website stated that the building would not be able to reopen. This statement was later amended to "Closed Permanently". That same year, the Oklahoma Office of Historical Preservation received an anonymous phone call from a man threatening to bulldoze the building. Local news station "News 9" suspected this to be Bob Bavinger, the now owner of the house and son of Eugene and Nancy and went to investigate. Upon arrival however, they were welcomed with gunfire. Speaking of the building's fate, the younger Bavinger told the Norman Transcript in 2011 that there was an ongoing conflict with the University of Oklahoma over the home's ownership and restoration. He said that demolition “was the only solution that we had, we got backed into a corner.” Come August 2012 though, the website of Bavinger House issued a statement saying: "The House will never return under its current political situation." Four years further on April 28 2016, Caleb Slinkard in the Norman Transcript reported “all that is left of the Bavinger House is an empty clearing.” For those who never had a chance to visit the building, a video walkthrough is available here courtesy of Skyline Ink. Allan Houser: A Celebration Philbrook Museum of Art 116 East Brady Street, Tulsa, Oklahoma Through November 2 Allan Houser: A Celebration is an ongoing exhibition at the Philbrook Museum of Art in Tulsa that honors the paintings and sculptures of late Native American artist Allan Houser. 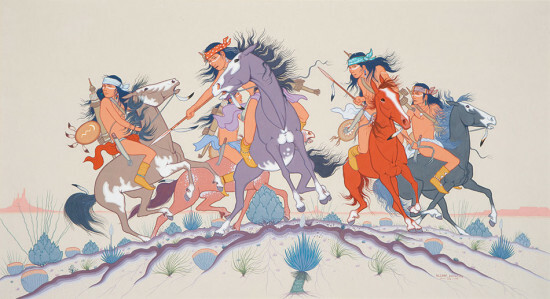 The exhibition commemorates Houser’s 100th birthday this year and highlights his contributions to Native American painting and sculpture during his time as an active artist. The works displayed will center on the Indian Annual, an art competition sponsored by the Philbrook, which Houser both partook in and judged. Houser has a decorated history at the Indian Annual. He won the Grand Award (given to the best art piece in the show) a total of five times. In addition to those awards, Houser received the Waite Phillips Award for Lifetime Achievement in 1969 and judged the competition for 13 years from 1963 to 1976. Houser centennial appreciation is happening elsewhere in the state as well. 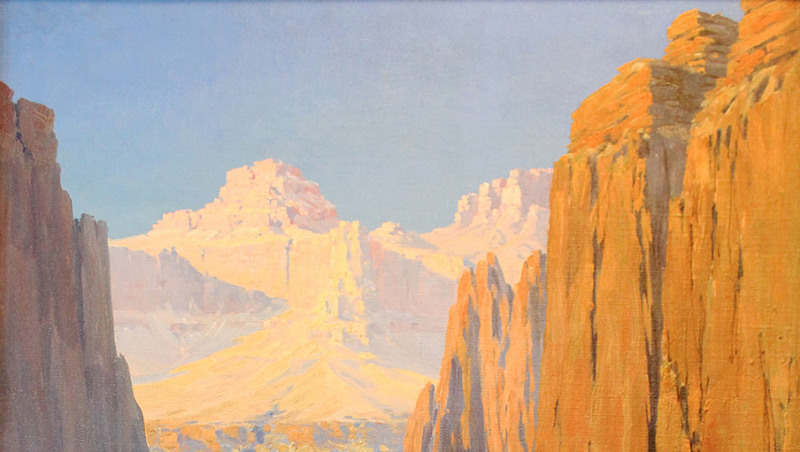 The Oklahoma Museum of Art in Oklahoma City just concluded its exhibition Allan Houser: On the Roof.